Muesli makes a delicious breakfast. Try drizzling with milk. 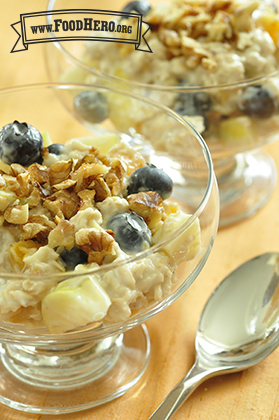 Substitute any frozen, canned/drained, or fresh chopped fruit for apples and blueberries. Flavor boosters: cinnamon, grated orange peel. In medium bowl, mix oats, yogurt, and milk. Cover and refrigerate for 6 to 12 hours. Add dried and fresh fruit, and mix gently. Serve scoops of muesli in small dishes. Sprinkle each serving with chopped nuts. 6 Comments for "Very Berry Muesli (‘mew-slee’)"
I would like to know if you have any recipes that use dry mix Muesli making nutritous and filling breakfast bars? I made this last night, and it was great! I added the frozen berries and chopped apple in with the oats overnight and it was a perfect grab and go breakfast for my busy morning. This recipe is so easy my teenage daughter can make it the night before and have an easy healthy breakfast before she leaves the house. I am going to try this with greek yogurt next! I loved this recipe it was simple and my kids enjoyed it. Thanks so much! We just re-programmed the directions portion of the website to fix this problem. This is one we overlooked. Thanks to your alert, it's fixed now.